Political risks have sharply increased, which could result in economic repercussions. 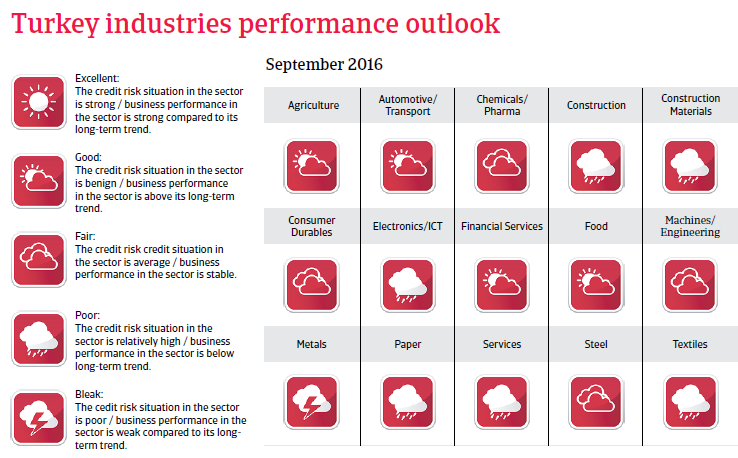 Higher credit risks in the corporate sector are a major issue. After the failed coup attempt on July 15, 2016 the Turkish government declared a state of emergency and started a massive crackdown to purge officials alleged for suspected links to the coup and to Fethullah Gülen, a Muslim cleric exiled in the US. More than 20,000 military, policemen, judges, prosecutors and officials were detained, about 60,000 officials and civil servants were suspended. Additionally, many media outlets were closed and journalists arrested. Meanwhile, President Erdogan extended the purge to Turkish businesses with suspected links to the Gülen movement. Already before the failed coup in July 2016 increasing government actions to curb the independence of the judiciary and political interference in the media have raised domestic and international concerns. Those concerns have grown, especially in the US and the EU, and Turkey's relationship with both has deteriorated since the failed coup. Since 2014, geopolitical risks have significantly increased. The south-eastern part of the country has been affected by a massive inflow of refugees from Syria and fighting close to the border. This region is also severely affected by the flare-up of fighting between Turkish forces and the Kurdistan Workers´ Party (PKK), after the government ended a two-year ceasefire and terminated informal peace talks with the PKK. At the same time, several IS-led suicide bomb attacks have hit several cities, including Istanbul and its main airport. Given the increased political risks due to the turbulent domestic political situation, the new escalation of the conflict with the PKK, terrorist attacks and more strained relationships with the EU and the US, economic repercussions in the mid- and long-term cannot be ruled out., e.g. a decrease in foreign investments and consumer spending. This could negatively impact economic growth, external funding opportunities, refinancing and insolvencies. In the last decade, Turkey has made impressive economic progress. With political stability since 2002, when the AKP came to power, the country has experienced GDP growth exceeding the European average, while real per capita income has increased markedly. A fast growing population of more than 75 million and rising prosperity have turned Turkey into one of the most prominent emerging markets. 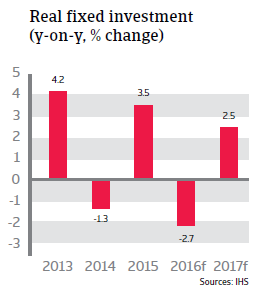 However, since 2013 Turkey’s structural economic weaknesses have resurfaced: among them its stubbornly high inflation, large gross external financing needs, heavy reliance on volatile portfolio capital inflows and relatively weak international liquidity and currency volatility – now coupled with sharply increased political risks. In 2016 and 2017 Turkish GDP growth is expected to decrease to about 3% due to lower private consumption and contracting investment. The deteriorated internal security situation increased concerns about the independence of the central bank and is negatively impacting business and investor sentiment, leading to delays in new investment decisions. Tourism is widely affected by internal security concerns. Being a large oil importer, the Turkish economy should profit from lower oil prices, which should help to boost private demand, lower inflation and narrow its persistently large current account deficit - a result of low savings and high investment. 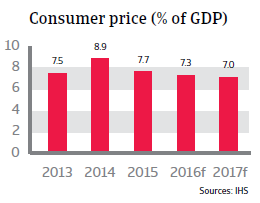 However, inflation is expected to remain high in 2016 and 2017, at around 7%, well above the official 5% medium-term target, as the strong lira depreciation (about 20% against the USD in 2015) has offset the disinflationary effects of low oil prices. 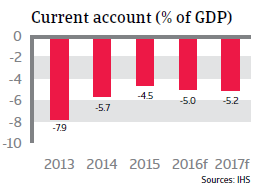 The current account deficit is expected to remain above 5% of GDP in 2016 and 2017, also due to decreased tourism. Increasing foreign debt and substantial capital imports (foreign direct investment and portfolio capital) are needed to cover the current account deficits. However, since much of those deficits are financed from volatile short-term capital inflows and sensitive portfolio investment, this makes the economy very vulnerable to any negative shake-ups in financial markets, which could trigger a massive capital withdrawal and could also lead to more fluctuations in the lira exchange rate. Triggers for such shifts are not only external, but also internal and particularly related to the security situation and concerns about monetary policy credibility. 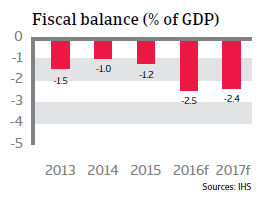 Turkey´s foreign debt has sharply increased in recent years, from 38% of GDP in 2018 to 56% at the end of 2015, with more than 90% denominated in foreign currency. That said, shock absorbing capacity is underpinned by sound government finances, a healthy banking system and still good access to international financial markets. The rise of corporate debt in Turkey significantly outpaced economic growth in 2015. As a result, the corporate debt-to-GDP ratio more than doubled reaching 59% in Q3 of 2015. Although the level is still moderate, the debt structure is concerning, with more than a third of this debt financed externally. Turkish corporates, particularly in the energy sector, have extensively borrowed in foreign currency from local banks, reflecting relatively high dollarization in the Turkish banking system. The exposure of Turkish corporates to foreign currency risk is thus higher than external debt figures suggest. The most vulnerable sectors in Turkey are energy, construction materials, steel, transport (airlines) and chemicals. Smaller sized firms with earnings mostly in local currency that are not sufficiently hedged are most at risk. So far, Turkish corporates have good access to international capital markets with rollover rates of corporate external debt remaining above 100% and maturities being lengthened. The Turkish central bank has also recently taken measures to reduce dollarization of domestic lending and Turkish corporates have improved their maturity profile. The investment climate is also hampered by a weak judicial system and an inflexible labour market. Moves to privatise state banks and the power sector are also proceeding too slowly. 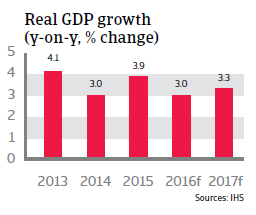 Without structural reforms to raise savings, reduce dependency on energy imports and improve the investment climate, Turkey´s potential growth rate will decrease to 3%-3.5% per annum. However, no major structural reforms are expected in the current political situation. 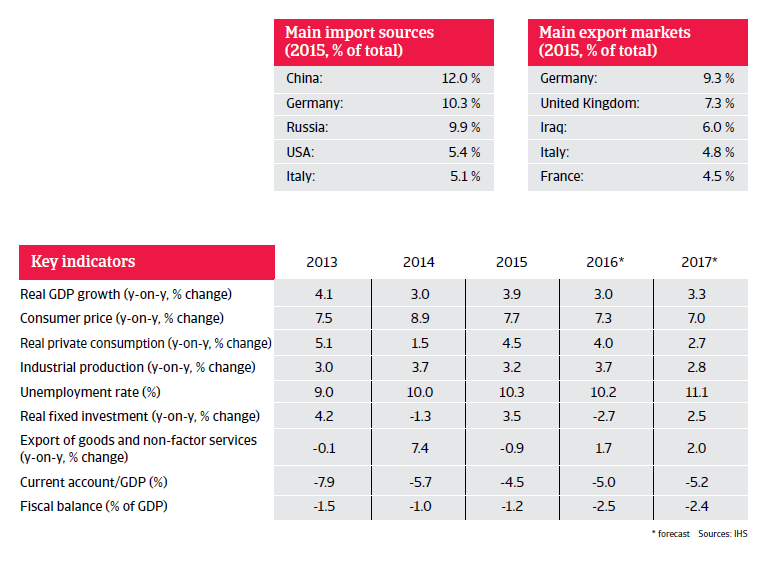 The Turkish machinery sector faces some troubles, with sales under pressure since 2015. Political uncertainty leading to less capital expenditure.